Every now and then burninate requests are created. Some of them concern tags that are not very extensively used (e.g. Exclude [exclude]), so we can clean them up manually. 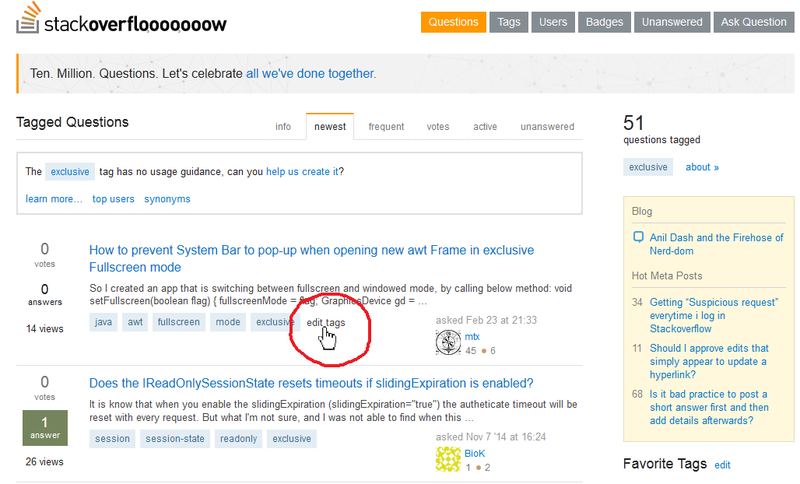 The feature of inline tag editing is very helpful in this case. This would allow really fast&convenient handling of the aforementioned burnination requests. The described feature should be of course available only to 10k+ users, to match with the conditions for inline tag editing privilege. Is it time to [wrap] it up? I really don't like this idea. I think it directly contradicts the established guidelines for the burnination system and the editing system overall. So a feature-request that allows for incomplete edits, even for 10k+ users seems like a bad idea. It's hard to tell from the question preview which tags are really appropriate anyway. This feature would allow for not only sub-par overall edits, but also sub-par tag edits. As Patrice comments, this feature request might also be optimizing the wrong thing. Burnination-related tag edits probably are the exception instead of the norm. Making a feature oriented towards the less common use case could backfire and make the normal case harder to do correctly. How are tags removed? Is there other cleanup work that should be done first? There isn't and shouldn't be a tool for this usable by the general public. This is a manual process which involves going to each individual question and editing it to remove the tag, along with fixing any other issues with each question. Not the answer you're looking for? Browse other questions tagged feature-request tags burninate-system . What is wrong with minor edits?